This is a 2 Year Warranty. 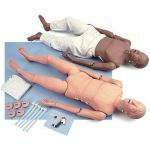 Simulaids’ new CPR Recording Manikin eliminates the challenge every instructor faces: adequately gauging student performance. This manikin precisely measures all of the actions associated with CPR and compares them to AHA CPR Standards. Results are scored as a percentage of the performance compared to the standards. There are no programming issues and no extra equipment needed unless you want to display the screen on a larger format device. The programming can be used for compression only functions. Select a performance time span and initiate the recording. 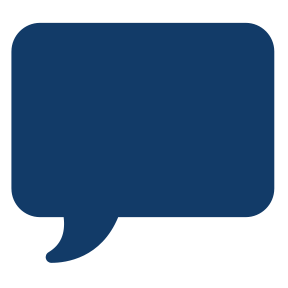 When the student completes their skill test for the length of time necessary, the recording device automatically rates the student on a percentage basis according to the preset parameters. For instance, eliminate the ventilation parameters and the score will reflect pure compression information. 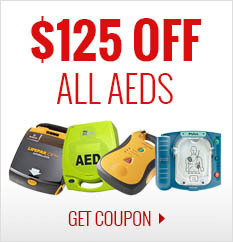 Leave all the parameters active and you can determine when certifiable CPR has been performed. Print options allow you to store the record or create paper documents. Real time evaluation of the student’s performance by the instructor occurs by visualizing the laptop screen. Instructor correction and encouragement changes a poor performance into an acceptable one. Print out the performance and show the student how much they have improved. This manikin utilizes the Brad-style airway and face pieces. 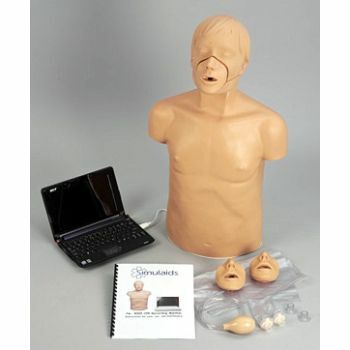 Included with the manikin are: mini-laptop computer, three face pieces, three lungs, carry case, and user information.